development of new research tools and devices ready for commercialisation. Low-cost and rapid micromachining technologies allow the development of easy-to-use LOC devices. We have the capability of making micro devices based on silicon, silicon carbide and polymeric materials, such as elastomers and thermoplastics. With new tools and devices fabricated in-house, we investigate fundamental phenomena at the micro- and nanoscale, especially in the areas of nanofluidics, micro-optofluidics and micro-magnetofluidics. Micro-optofluidics is an emerging technology that allows exploiting the interactions between fluid flow and light for novel applications. The combination of magnetism and fluid flow in microscale opens up the exciting research field of micro magnetofluidics. Results from these fundamental studies lead directly to applications such as LOC. In the third research thrust, we focus on the development of new LOC devices serving as tools for biomedical research. 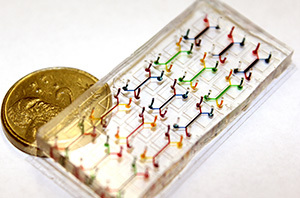 For instance, we have been developing and testing organ-on-a-chip devices that mimic in-vivo condition with controllable surface topology, mechanical strain and concentration gradient. Ongoing collaboration with the Griffith Institute for Drug Discovery and Institute for Glycomics aims at the development of new tools for high-throughput drug screening and malaria research. Project leader: Professor Nam-Trung Nguyen. Team members: Dr Dzung Dao and Dr Yong Zhu.